Ottomans can bring a simple elegance and high-end fashion to living rooms of any furniture style. They update a room with an accent that is elegant but also offers comfort. This particular ottoman has a versatile style that can be used in casual, contemporary, traditional and transitional styles. 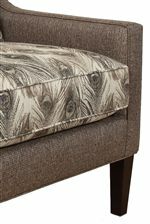 The tapered wood legs bring a simple elegance and the welt cord trim adds a tailored accent. Use this ottoman on its own or with its coordinating collection chair. The 1884 and 1887 Ottoman in Small Rectangle Shape by England at AHFA in the area. Product availability may vary. Contact us for the most current availability on this product. The 1884 and 1887 collection is a great option if you are looking for furniture in the area. Browse other items in the 1884 and 1887 collection from AHFA in the area.